Important Note: This product is available in both a printed book format and a CD format. You save money if you order both formats at the same time. Ages 13 through 19. 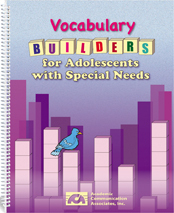 Use this book to teach vocabulary to adolescents with vocabulary deficits. Each lesson includes an informational article with 10 key vocabulary words. Words commonly used in newspapers and within the secondary school curriculum are emphasized. The articles help students focus on word meanings as they learn about important topics such as finding employment, protecting the environment, protecting the environment, protecting the rights of others, and reacting to social interaction problems appropriately. After listening to each article, students respond to questions related to the information presented and the meaning of the target vocabulary words. Worksheet activities challenge students to use the target vocabulary words, to think of synonyms, to use contextual information, and to give precise word meanings. All of the activity worksheets may be reproduced. The activities build vocabulary, verbal reasoning, and critical thinking skills relevant to the academic curriculum and the daily living needs of students. Speech-language pathologists and specialists in learning disabilities will find this to be a valuable resource. The book can also be used to help second language learners acquire vocabulary relevant to success within the classroom. This product is the same price in both book and CD formats. The CD includes the entire book in a PDF format that can be used if you have Adobe Reader on your computer. This program is available at no charge from www.adobe.com. The printed book edition and the CD edition are the same price if ordered separately. Save money when you order both the book and CD at the same time. The CD makes it easy to print out copies of the reproducible book pages.